We’d love your help. Let us know what’s wrong with this preview of A Sting in the Tale by Dave Goulson. One man's quest to save the bumblebee. Dave Goulson has always been obsessed with wildlife, from his childhood menagerie of exotic pets and dabbling in experimental taxidermy to his groundbreaking research into the mysterious ways of the bumblebee and his mission to protect our rarest bees. Once commonly found in the marshes of Kent, the short-haired bumblebee now only exi One man's quest to save the bumblebee. Once commonly found in the marshes of Kent, the short-haired bumblebee now only exists in the wilds of New Zealand, the descendants of a few queen bees shipped over in the nineteenth century. Dave Goulson's passionate drive to reintroduce it to its native land is one of the highlights of a book that includes exclusive research into these curious creatures, history's relationship with the bumblebee and advice on how to protect it for all time. 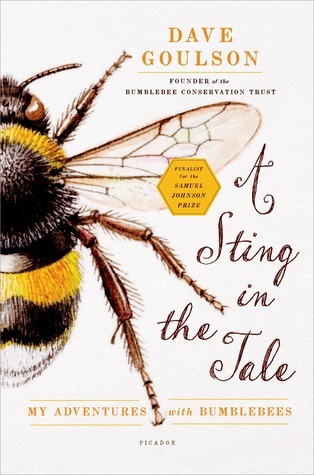 To ask other readers questions about A Sting in the Tale, please sign up. Du wolltest dazu seit über einem Jahr eine Rezidings schreiben! -.- ? It is humbling to reflect that though a bumblebee has a brain smaller than a grain of rice, it has powers of perception and learning that often put us mammals to shame. For one thing, you will learn a ton of information about bees. Goulson focuses on bumblebees but you will learn a few things about honeybees as well. For another thing, Goulson is HILARIOUS. Oh my gosh, I was laughing like a maniac while reading this book. Everyone was looking at me strangely. Oftentimes people suspici It is humbling to reflect that though a bumblebee has a brain smaller than a grain of rice, it has powers of perception and learning that often put us mammals to shame. For another thing, Goulson is HILARIOUS. Oh my gosh, I was laughing like a maniac while reading this book. Everyone was looking at me strangely. Oftentimes people suspiciously asked me what was so funny. They probably thought I was cracked having laughing fits over a non-fiction book about bees. But Goulson is so funny! I can't compare him to Mary Roach, no one will ever be Mary Roach, but still, he is immensely charming and amusing. The only caveat I'd place on the book is that the prologue deals with Goulson's childhood and specifically his pets growing up. Many met gruesome and horrifying ends. Not because Goulson was a malicious serial-killer-in-training or anything, simply because he was too young to have pets and care for them without any adult supervision whatsoever. He describes his pets' deaths in funny ways that are designed to make you laugh, but for those whom animal deaths are never a laughing matter (especially when unnecessary and preventable) I thought I'd include this little warning. Animals die and they die horribly, often as a direct result of Goulson's neglect or his particular brand of 'caring.' Read the prologue at your own risk, you know your own tolerance levels. A marvelous little book about bumblebees! Non-fiction at its best, entertaining and thought provoking. I thought honey bees were important pollinators, but bumblebees are too. For example tomato plants are only pollinated by bumblebees. Until these were bred for commercial use in the 1990's or so, tomato plants were pollinated by hand - by humans! Sadly many bumblebees are on the verge of extinction due to invading species, disease and loss of habitat. The author knows his subject intimately and A marvelous little book about bumblebees! Non-fiction at its best, entertaining and thought provoking. I thought honey bees were important pollinators, but bumblebees are too. For example tomato plants are only pollinated by bumblebees. Until these were bred for commercial use in the 1990's or so, tomato plants were pollinated by hand - by humans! Sadly many bumblebees are on the verge of extinction due to invading species, disease and loss of habitat. The author knows his subject intimately and tells about it with a great deal of humor. We have barely begun to understand the complexity of interactions between living creatures on earth, yet we often choose to squander the irreplaceable, to discard those things that both keep us alive and make life worth living. Perhaps if we save a bee today we can save the world tomorrow? An enlightening read about the nature and plight of (mostly) British bees and how important they are to us. Dave Goulson is clearly an expert on bees, and incredibly knowledgeable about a lot of other wildlife and insects, and this book is jam-packed with information he has garnered about bees and their behaviour throughout his academic career researching them across the UK and in New Zealand on various research trips with his PhD students. I have always been interested in bees, and have learnt more from this book than I ever thought I would know about them! This is delightful little book about the bumblebee, written by Goulson, one of the few people who are experts on this amazing insect. 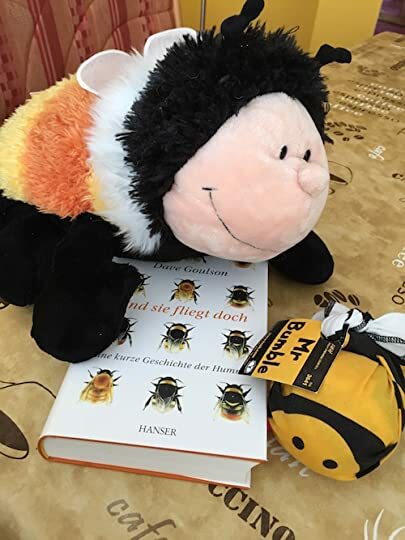 In the book he explains about the different species that we have in this country, and outlines some of the research projects that he has been doing on the populations of these bees, re-introduction programmes and other projects that his students have undertaken. He writes about a property that he bought in France, that he is turning the brass back into a wildlife m This is delightful little book about the bumblebee, written by Goulson, one of the few people who are experts on this amazing insect. In the book he explains about the different species that we have in this country, and outlines some of the research projects that he has been doing on the populations of these bees, re-introduction programmes and other projects that his students have undertaken. He writes about a property that he bought in France, that he is turning the brass back into a wildlife meadow, to disbelief from the locals. He founded the BBCT, and it has grown to have 11 staff and hundreds of members. I was addicted to this lovely book! Thank You, Dave Goulson for writing this gem. Djupt sympatiskt verk, alldeles uppenbart skriven med kärlek om kärlek till humlor. Det kommer vara med extra innerlig lycka jag möter vårens första humla detta år. There’s a lot of personal reflection, including talking about what he did as a kid to get involved with bees, and his place in France where he’s rewilding a field to attract more wildlife. It’s not strictly scientific, by-the-book facts, that’s for sure; for me, that added to the appeal. I could almost get excited about bees, through the eyes of Dave Goulson — and I could definitely get excited about his conservation goals and hopes. An approachable introduction to bumblebees and British wildlife conservation issues in general. Very charming and humorous at points. Written more like an autobiography than a science textbook, so if you're looking into reading something different this year, would recommend picking this book up. One man's adventure's studying bumblebees. We live on the side of a mountain and have a brook running close to the back door. On the opposite side of the brook is a steep hill where blackberry, raspberry, native honeysuckle, birch, apple, tamarack and maple grow. What we didn't know was that there was a bumble bee nest in the hill, also. An animal dug up the nest two weeks ago, while I was reading this book. Whatever dug up our nest was not a bear (the excavation was too small and it was too close to the house), so we couldn't figure out We live on the side of a mountain and have a brook running close to the back door. On the opposite side of the brook is a steep hill where blackberry, raspberry, native honeysuckle, birch, apple, tamarack and maple grow. What we didn't know was that there was a bumble bee nest in the hill, also. An animal dug up the nest two weeks ago, while I was reading this book. Whatever dug up our nest was not a bear (the excavation was too small and it was too close to the house), so we couldn't figure out what it was. Because of this book, we now think it was raccoon. Goulson talks of how UK badgers love to dig up bee nests, but there are no badgers here. Badgers are related to weasels so we surmised our digger was weasel, mink or fisher cat. But in another chapter, Goulson mentioned that UK weasels don't dig up nests. That left us with fisher cats, skunks or raccoons. Fisher cats won't come this close to the house unless desperate. Skunks have not lived here for years since the raccoons came. And talking to others, we have narrowed our thief down to raccoon. I have photographs of the ransacked nest but I hope the bees find a nest site there next year. Now I understand their life cycle and how delicate the balance is between the bumble bees and our wildflower fields. I have learned how to encourage the succession of more of our wildflowers. I will follow the early queens that I see on our back road next spring as they search for a nesting site. I will take more time to sit and observe the comings and goings of the three native species of bumble bees that we have here. I want to learn to find nests. Goulson is a skillful writer. His narrative and descriptive writing are very engaging. I laughed and even cried at one point. The forward to the book, describing Goulson's life when he was a boy, was the best part of the book. The saddest parts are those where he vividly compares that world to our world now, with devastated and fragmented habitats. I am so thankful to be able to live in a large rural area with bears, moose, bobcats, deer, turkeys and all manner of birds, fowl and invertebrates. I am blessed and will never take it for granted that this will last forever. It needs to be protected and cherished. There are already huge pressures on the land from development and a poor economy. BBC BLURB: Dave Goulson has always been obsessed with wildlife, from his childhood menagerie of exotic pets and dabbling in experimental taxidermy to his groundbreaking research into the mysterious ways of the bumblebee and his mission to protect our rarest bees. Once commonly found in the marshes of Kent, the short-haired bumblebee now only exists in the wilds of New Zealand, the descendants of a few queen bees shipped over in the nineteenth century. Dave Goulson shares exclusive research into these curious creatures, looks at history's relationship with the bumblebee and offers advice on how to protect it for all time. We'll also hear about bumblebee sniffer dogs, how bees navigate their way home and why you should remember these tiny furry friends next time you pour ketchup on your fish and chips. One of the UK's most respected conservationists and the founder of the Bumblebee Conservation Trust, Goulson combines Gerald Durrell-esque tales of a child's growing passion for nature with a deep insight into the crucial importance of the bumblebee. He details the minutiae of life in their nests, sharing fascinating research into the effects intensive farming has had on our bee populations and on the potential dangers if we continue down this path. Producer: Joanne Green A Pier production for BBC Radio 4. In kleurrijke plastic doosjes vingen we vlinders die rond de bloemen in onze tuin fladderden. Aan de rand van het bos groeven we potjes in de grond en lokten torren en kevers in de val. Sprinkhanen lieten we van onze handen springen terwijl we met de wantsen verstoppertje speelden. En op de hei hupten en hopten we met ons vangnetje achter krekels en libellen. Maar de bijen sloegen we terzij en voor de hommels doken we weg. Ik lees Een verhaal met een angel en ik vraag me af waarom. Vol passie en In kleurrijke plastic doosjes vingen we vlinders die rond de bloemen in onze tuin fladderden. Aan de rand van het bos groeven we potjes in de grond en lokten torren en kevers in de val. Sprinkhanen lieten we van onze handen springen terwijl we met de wantsen verstoppertje speelden. En op de hei hupten en hopten we met ons vangnetje achter krekels en libellen. Vol passie en met ontzettend veel plezier - je hoort in zijn zinnen haast de guitigheid van z'n stem - vertelt Dave Goulson over zijn jarenlange onderzoek naar hommels. Het soms enerverende gezoem en de dreigende angel raken snel vergeten wanneer je leest over de genialiteit waarmee dit diertje zijn werk uitvoert. De ene anekdote slaat de verstomming en verbazing op de andere wetenswaardigheid in. Hommels zijn meer dan de logge insekten die we in onze tuin van bloem tot bloem zien zoemen. Het zijn kleine mensjes waar de groten ontzettend veel van zouden kunnen leren. A lot of BUZZ about this really interesting book telling the evolution and history of bees. Goulson's enthusiasm for the natural world and the life of bees is contagious. The book is true science and fact but it is written in a way that is warm and delightful: I frequently found myself wanting to put it down to go bird and bee-watching. Example; when talking about the sheer amount of energy/calories that bees burn through (they move their wings 200 times per second), he gives this analogy: It wou A lot of BUZZ about this really interesting book telling the evolution and history of bees. Goulson's enthusiasm for the natural world and the life of bees is contagious. The book is true science and fact but it is written in a way that is warm and delightful: I frequently found myself wanting to put it down to go bird and bee-watching. Example; when talking about the sheer amount of energy/calories that bees burn through (they move their wings 200 times per second), he gives this analogy: It would take an average sized man about one hour to burn through the calories if he consumed a Mars bar, if a bee were the size of an average man and ate the same Mars bar, it would take only 30 seconds to burn though those calories. I really enjoyed this author and his stinging wit (sorry; I couldn't resist). I really, really liked this book! For some reason I was expecting it to be dry, but it wasn't. Dave Goulson is engaging, funny, and his love for bumblebees is contagious, probably. This beautifully presented book was a gift from Dr Lucy, the researcher who assisted with the information collection. Before I met Lucy, I would have preferred to crawl over broken glass than to read a whole book about Bees. Goulson has a rare gift of combining outrageous humour, subtle wit, glorious detailed facts, and a remarkable literary ability, devising a highly entertaining and fascinating book, all about bees. I had a wonderful week in Oxford and purchased too many books from Blackwells. This beautifully presented book was a gift from Dr Lucy, the researcher who assisted with the information collection. Before I met Lucy, I would have preferred to crawl over broken glass than to read a whole book about Bees. Goulson has a rare gift of combining outrageous humour, subtle wit, glorious detailed facts, and a remarkable literary ability, devising a highly entertaining and fascinating book, all about bees. This book was so good. I learned so much about bumblebees and felt like I could read out so much of the interesting facts that I learned from this book. How the nature works is fantastic! The only minus is the extra facts.. like how to stuff dead birds or butterflies.. just weird. Oh little bees, I will go and plant Lavender in the garden this weekend. The book opens with the story of the author travelling to New Zealand in search for a bumblebee now extinct in the UK. This makes for a compelling narrative in which the author navigates the reader through decades of research on bumblebees (and their recent dramatic decline) towards answering the question raised in the beginning of the book, i.e. can this short-haired bumblebee be successfully re-introduced to the British fields it came from? Although I am already very familiar with insect biolo The book opens with the story of the author travelling to New Zealand in search for a bumblebee now extinct in the UK. This makes for a compelling narrative in which the author navigates the reader through decades of research on bumblebees (and their recent dramatic decline) towards answering the question raised in the beginning of the book, i.e. can this short-haired bumblebee be successfully re-introduced to the British fields it came from? Although I am already very familiar with insect biology, I did enjoy the enthusiasm with which the author sets out to illuminate the reader. As this is obviously a topic the author is very knowledgeable and passionate about, I can even forgive him the anecdotal tone he strikes and the endless self-references. But this book indeed contained a sting in the tail, as we discover in the last chapter that the re-introduction is unsuccessful due to genetic erosion of the New Zealand population. Thank god there’s still a thriving Swedish population. Why on earth was that population not considered from the start? This would have circumvented the issues with synchronising the bumblebees to the seasons of the northern hemisphere and the poor genetic quality of a population founded by so few ancestors, not to mention prevented wasting research funding on senseless fieldwork on the other side of the planet. And why? Simply because the New Zealand retard-population felt more ‘British’… The whole operation was more about catering to the sentiment of ‘bringing our bumblebees home’ than about a successful reintroduction (not an innocent topic in itself). I would have expected a renowned ecologist like Dave Goulson to not let an alluring narrative dictate his actions. After a childhood chasing butterflies and collecting bird’s eggs, I studied Biology at Oxford University, and then did a PhD on butterfly ecology at Oxford Brookes University. Shortly afterwards I got a lectureship at University of Southampton, where I stayed for 11 years. It was there that I began to specialize in bumblebee ecology and conservation. In 2006 I became Professor of Biology and Stirl After a childhood chasing butterflies and collecting bird’s eggs, I studied Biology at Oxford University, and then did a PhD on butterfly ecology at Oxford Brookes University. Shortly afterwards I got a lectureship at University of Southampton, where I stayed for 11 years. It was there that I began to specialize in bumblebee ecology and conservation. In 2006 I became Professor of Biology and Stirling University. In 2006 I also founded the Bumblebee Conservation Trust, a charity devoted to reversing bumblebee declines. In 2013 I moved to Sussex University. I have published over 200 scientific articles on the ecology of bees and other insects, and am author of Bumblebees: Behaviour, Ecology and Conservation (2010, Oxford University Press) and A Sting in the Tale (2013, Jonathan Cape), a popular science book about bumblebees. A Buzz in the Meadow (Jonathon Cape) is due to be published in September 2014.